WELLSELEY, Mass. – It’s certainly no secret that Franklin girls lacrosse has a lethal offense that is tough to stop. But Longmeadow had the perfect game plan in the D1 State Semifinal: keep the ball away from the Panthers. The Lancers dominated draws and used lengthy offensive possessions, taking up to three or four minutes at times, especially in the second half. 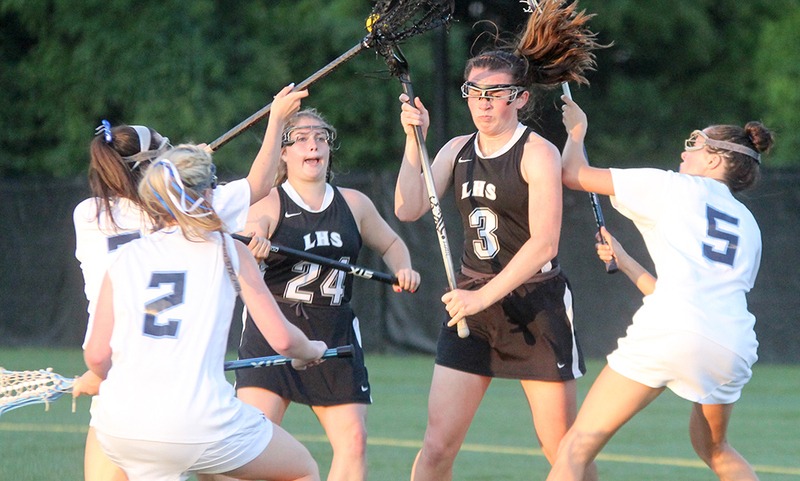 That formula resulted in a 12-6 win for Longmeadow and a trip to the D1 State Final. Longmeadow used a seven minute span to create an early lead. Claire Fitzpatrick put the Lancers up 2-0 with just over five minutes gone in the game and Alison Tetreault and Iliana Koffman (8 meter attempt) tallied goals in the minutes after. The Lancers’ 4-0 lead just under nine minutes into the game forced a timeout from Franklin. The timeout helped the momentum shift to the Panthers as they got on the board shortly after. Junior Jordan Jette found a cutting Caroline Lounsbury with a perfect pass in front and the senior buried it to make it 4-1. Longmeadow extended its lead to 5-1 just a minute later, but Franklin’s offense finally got in gear over the final 10 minutes of the half. First, freshman Kelsey MacCallum scored on an 8 meter try and three minutes later, Lounsbury faked the defense on an 8 meter try but passing to Jette, who used a double move in front to make it 5-3. Then it was time for Franklin freshman Erin Walsh to shine. With just over a minute left, with her back to goal, Walsh fired what Igoe described as a “twister” shot, fooling Valencia to make it 5-4. Franklin’s Grace McDermott made a terrific defensive play on a Longmeadow 8-meter try in the final minute, giving the Panthers a final possession. The Lancers were whistled for a foul with 15.8 left, giving Franklin a man-up opportunity for two minutes. Walsh capitalized just seconds before the halftime buzzer, once again scoring with her back to goal, shoveling a shot into the back of the net without giving Valencia a chance at a save. But as the first half ended, so did Franklin’s momentum. The Panthers only won three of 10 draws in the second half and Longmeadow started the second similar to how it did the first, rattling off a 4-0 run. Just over 10 minutes into the half, Fitzpatrick grabbed her first of the second half, capping off a two minute offensive spell to make it 9-5. “Their offense is big, they take their time and they have excellent stick work,” Igoe Guarino said. Lounsbury cut the deficit to three with a great individual effort with just over 13 minutes to play but the Lancers responded with a draw win and a goal just over a minute later. It looked like Erin Walsh had another goal as she beat the defense and the goalie with a wicked shot, but instead an infraction was whistled after the ball had gone in and Franklin’s 8 meter try went high. Longmeadow then milked the rest of the game, as neither side scored during a 10 minute span. With Franklin scrambling to force a turnover, the Lancers tacked on two more goals in the final 61 seconds. Franklin girls lacrosse finishes the season 22-2 and will lose four seniors – Lounsbury, McDermott, Dana Lewandowski and Kendall Reardon, all starters – to graduation. MILFORD, Mass. – For the second straight year, and third time in the last four seasons, the Division 1 East section runs through the Franklin girls lacrosse team. After an overtime thriller in 2014, and one-goal win exactly one year ago, the top-seeded Panthers left the dramatics behind, cruising to a 16-7 win over second-seeded Concord-Carlisle on the turf of Milford High School. While Franklin had wins over eight of the state’s top 20 teams – and a handful of wins over teams just outside the rankings – the Panthers certainly overlooking the Patriots. It didn’t take long for Franklin’s offense to get going as Caroline Lousnbury took a feed from Jette and opened the scoring just 22 seconds into the game. 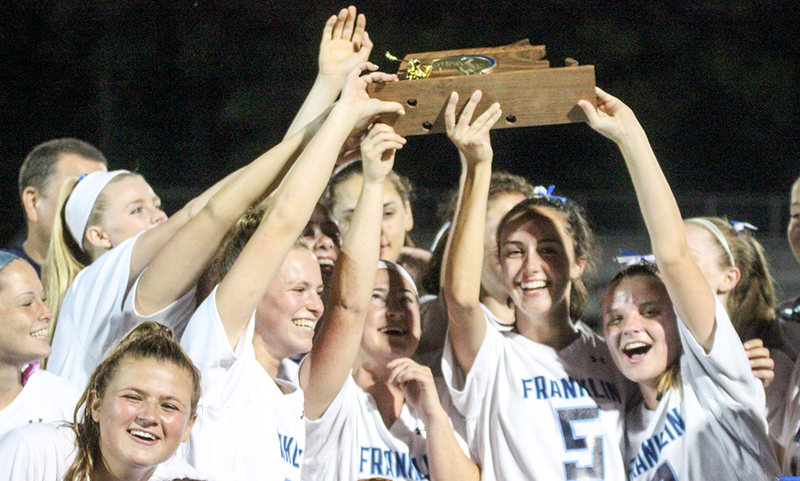 Before 90 seconds elapsed, Franklin doubled its lead with a goal from freshman Erin Walsh. While the Panthers never trailed, Concord-Carlisle battled back to make it a 3-3 game with just over 10 minutes to play. Franklin had a quick response though, Lauren Bissanti putting the Panthers back ahead on a feed from Annie Walsh, Walsh scoring on a cut in front on a feed from Jette, and Erin Walsh batting a loose ball out of the air into the net to make it 6-3. Shortly after the Patriots cut the deficit to two, Franklin went up a man for a misconduct call on C-C. The Panthers took advantage as Annie Walsh weaved her way through the Patriots’ and found the back of the net. With under a minute to play, Jette found Annie Walsh right in front for another goal and freshman Kelsey McCallum completed Franklin’s 6-1 run off a restart with just seven seconds to play in the half to make it a 9-4 game. The Patriots scored just 17 seconds into the second half to make it a four goal game but Annie Walsh responded a minute later to make it 10-5. And two minutes after that, Annie Walsh was at it again, taking a feed from Kendall Reardon to make it 11-5. Concord-Carlisle scored to cut it to 11-6 and quickly gained possession back after another draw win, but Franklin freshman goalie Gianna Cameron (10 saves) came up with big stop to give possession back to the Panthers. “We talked about playing defense as unit, not so much one on one defense,” Igoe Guarino said. Bissanti (from Erin Walsh) and Concord-Carlisle’s Margaret Grace traded goals to keep the lead at five as the game clock ticked under 10 minutes to play. If there was any hope of a comeback, Franklin finished the game with an exclamation point – scoring four goals over the final 9:24 of play. Jette netted her first on a feed from Reardon, Annie Walsh scored her sixth and seventh tallies of the game and Reardon capped the scoring with a strong individual effort with just under two minutes left. Franklin girls lacrosse (22-1) advances to the D1 State Semifinal and will take on the winner of Westboro (18-0) and Longmeadow (21-1) at Babson College. The game is schedule for either Monday or Tuesday night. FRANKLIN, Mass. – As the reigning D1 East Sectional Champs, and current top seed, the Franklin girls lacrosse team knows there is a target on their back. 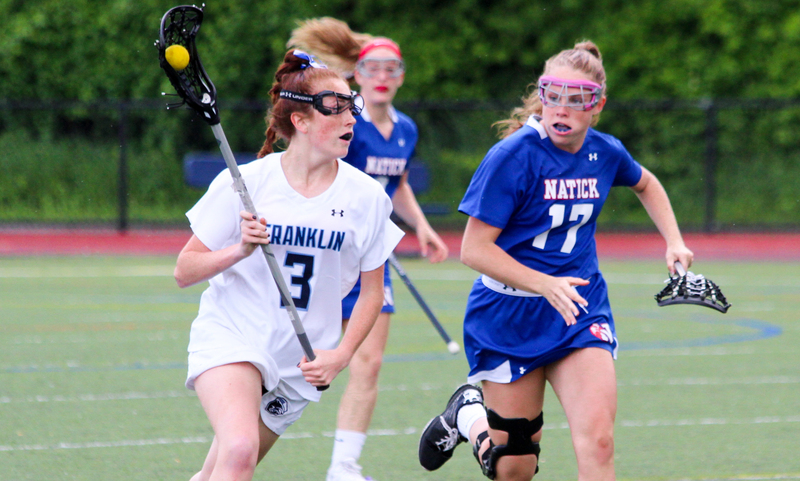 Natick came out firing on Thursday afternoon at Franklin High, but a strong second half effort and nine goals from sophomore Annie Walsh led Franklin to an 18-10 victory over eighth-seeded Natick. Heading into halftime, Natick led 7-6, completely controlled time of possession and led in draw controls at the break. Kendall Reardon started off the scoring for Franklin, scoring three minutes into the game, but on the ensuing Natick possession Annika Streeter would answer back to tie the game up at one. Streeter then set up teammate Victoria Norchi open in front of the net, and she scored to put the Redhawks up 2-1. Reardon would then score her second goal of the game to knot the game at two, but Norchi scored on an empty net to give Natick a 3-2 lead. Click here for a full photo gallery from HockomockSports.com Student Photographer Peter Raider. After Streeter scored again, Franklin got back to back goals from Erin and Annie Walsh to tie it back up at 4-4. Molly Burnes put Natick up 5-4, but Reardon’s third goal of the half tied the game up again. Back to back Natick goals from Streeter and Meghan Rodino would put the Redhawks up 7-5, but Annie Walsh scored her second goal of the game with 1:33 left in the half to cut the Franklin deficit to just one at 7-6. The Panthers clearly took that message to heart, as seconds into the half Jordan Jette found Annie Walsh cutting to the net wide open for a goal to tie it at 7-7, and 30 seconds later freshman Kelsey MacCallum found the back of the net to make it 8-7 with 24:09 left to play. Franklin wouldn’t look back from there with Annie Walsh netting five consecutive goals herself, to go up 13-7 with 10:58 left in the game. Walsh’s fifth goal, which put Franklin up 10-7, was the 100th of the sophomore’s already incredibly successful career. She would finish with nine goals, including seven in the second half. 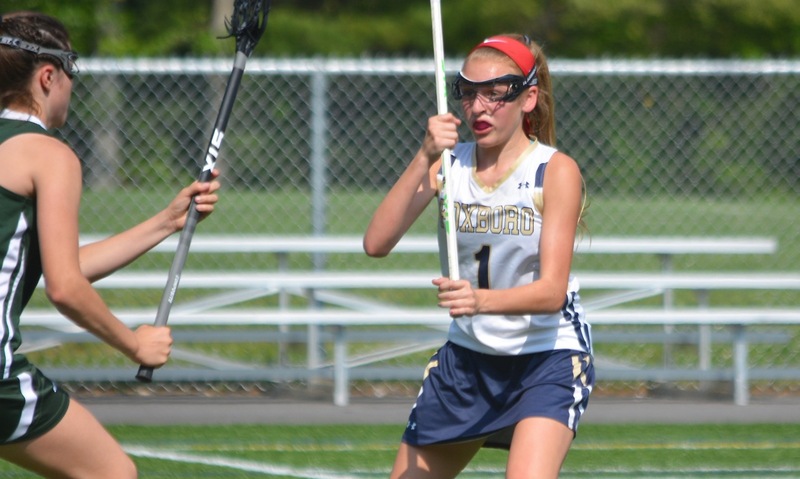 “She’s amazing at draws, ground balls, in between the 30s, and on offense, so I think that’s the kind of player to look for when you’re down, and she did it very well,” Igoe Guarino said about Walsh. After Streeter scored the third of her five goals for Natick, Erin Walsh scored to make it 14-8 with 9:16 left to play, and then Reardon scored the fourth of her five goals to extend the Franklin lead to 15-8 with just over eight minutes to go in the game. Streeter scored back to back goals to make it 15-10, but goals from Erin and Annie Walsh and Reardon would give Franklin a final advantage of 18-10. For Franklin, the road to a state championship only gets tougher. With the win, the Panthers move onto the D1 East Semifinals, where they’ll play the winner of the King Philip-Lexington game, which will take place Saturday at 3:30 in Lexington. Franklin girls lacrosse (20-1) is familiar with Hockomock League foe King Philip, beating the Warriors 18-6 on May 24th. The date and time of Franklin’s semifinal matchup is currently to be announced at the time of publication.